Last weekend C. M. Walsh was back in Austin for the second time in the last four months, this time for business with the AMS conference and trade show in town. On Saturday we all hung out at the house and later went to Red’s Porch for dinner and then The Warehouse, the Vikings’ Austin fan club, for the playoff game. The night was far from over though, as Lauren dumped us off at The Water Tank for karaoke, where Bart and Mike joined us. There was a big crowd and we only were each able to do one song, but I nailed Clint Black’s “Burn One Down” while Walsh brought the crowd to its feet with Al Green’s “Let’s Stay Together.” After that, we moved on over to Little Woodrow’s where Walsh and I teamed up to give some foosball hustlers a run for their money. 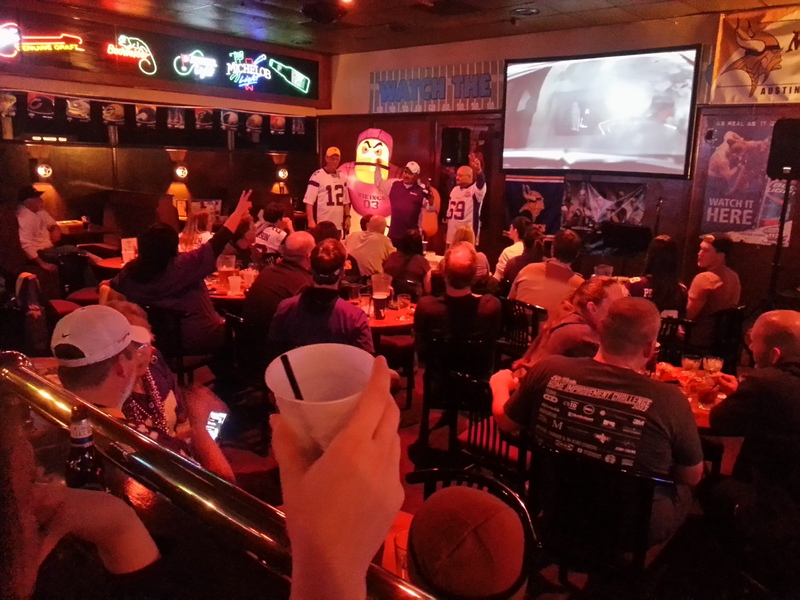 There was a surprisingly good turnout of local Vikings backers. The next day we felt like crap and napped much of the afternoon before Walsh went back to his nearby hotel. On Monday after work, I met back up with Walsh and we walked the exhibitor floor at the AMS trade show. Walsh of course had real business to conduct, while I wandered around and grabbed free pens and calendars. 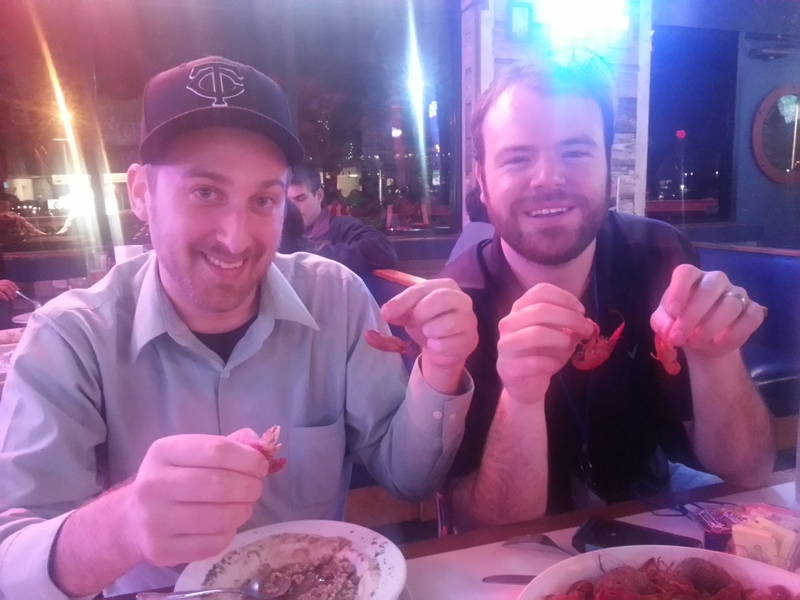 After the successful show, Lauren joined us for dinner at Sam’s Boat where Walsh and I split three pounds of crawfish, something neither of us had ever tried before and more than likely wouldn’t again. Eating crawfish at Sam’s Boat. On Tuesday night and Wednesday, we got our first significant rainfall in months. I was originally supposed to have a wiffleball playoff game but it was rained out despite being indoors. 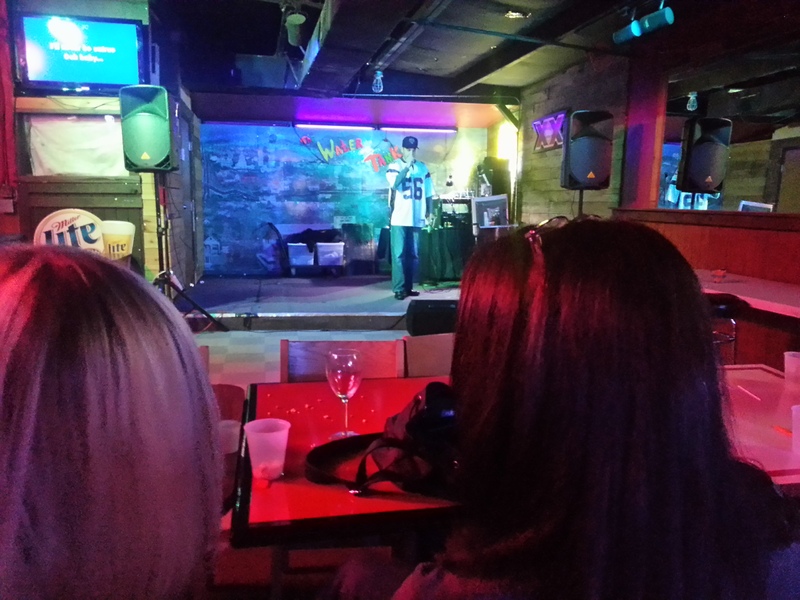 Instead I helped Bart and Mike recruit singers for their upcoming karaoke league at the Common Interest. There, we each did about four songs apiece before I braved a downpour and drove home. 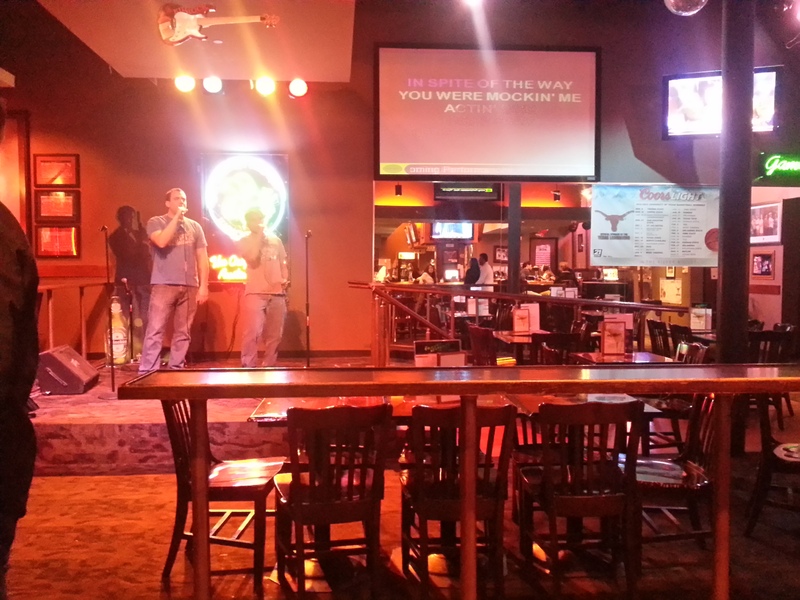 Bart and Mikey Mike sing to the packed house at Common Interest. That healthy challenge I mentioned a while back… yeah that is not going too well. It was just fourteen days but I couldn’t do it. In my opinion, in order to succeed at that, we will have to be a lot more prepared and have an entire meal plan scheduled out. Once I got to work with no healthy lunch in hand, I had very few choices nearby to pick from. I attempted to make up for that by working out three times over break this week. I would also like to note that I finished reading The Blind Side and then watched the movie right after. The book was much better and obviously way more factual. I can’t help but cheer for Michael Oher as the Ravens continue on in the playoffs this weekend.